We are Canadian and we love kites! Welcome to our new home in cyberspace. Explore our website to discover the magic of kites in Canada! If you fly a kite in Canada or are a Canadian flying kites abroad, you are one of us! We represent all forms of kiting: from fighter kites to kitesurfing, from sportkites to kitemaking, from classroom kites to kite collecting. Come join the unique camaraderie that binds kitemakers on Vancouver Island to Snowkiters in Nunavut to kite aerial photographers in Nova Scotia. We are a fellowship of clubs and individuals across Canada. Thanks for visiting! Ontario kiters pose at 19th Four Winds Kite Festival in 2008. Canadians Sarah McNair-Landry, her brother Eric and friend Curtis Jones crossed the Gobi Desert this past summer on kite buggies on a 40-day expedition that took them 1100 kms across the harsh conditions of Mongolia. 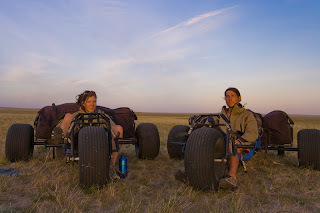 Their team named Pittarak embarks on extreme expeditions not only for the challenge but to inspire others, especially youth, to get active and pursue their goals. The team trained extensively by flying kites and experimenting with buggy configurations last summer on Québec's Îles de la Madeleine. The vast sand beaches were great preparation for the sandy terrain of the Gobi Desert. No stranger to extreme sports and kites, the siblings previously crossed Greenland via kite skiing in 2003 when she was 16 and he was 18. You can read about their travels on their travel blog. Learning about geometry can involve more than just classroom lectures and textbooks. Flying kites can help, too. Glenn Davison, a kite flyer, maker, lecturer and workshop leader from Chelmsford, Mass., spoke to two honors geometry classes at Windham High School on Tuesday, Oct. 20, and Wednesday, Oct. 21. His talks with students helped tie together – in a fun way – aspects of math and science and art. Davison’s presentations, held in the auditorium, covered the importance of symmetry in kites, flight angle, some of the physics involved in kite flight, methods of stability and the importance of sail loading – the ratio of sail area to weight. He had been invited to speak by math teacher Kristin Miller. Davison had attended the Kites Over Windham kite-flying event during the town’s Harvest Festival during the previous Saturday. Some of Miller’s students were there, too, flying kites. Miller had instructed all of her geometry students to research various kite designs, create a sketch of their design choice and make a kite including required geometry components. The students worked in pairs using their own materials, and those who had time attended the festival to fly their kites. The kite-flying event, held at Griffin Park, was hosted by the Windham Initiative for Renewal Energy. The organization’s mission is to inspire citizens and educate students about the benefits of renewable energy. WIRE also seeks to install a wind turbine, solar photovoltaic array and weather station monitoring system at the high school. Davison has participated in kite festivals throughout the world, including events in Taiwan, Colombia, Nova Scotia and India. Kites Over New England, a club for kite flyers of all ages that Davison serves as vice president, had been invited by WIRE to participate in the local kite-flying event. During his presentations at the school, Davison showed a variety of kites to the students, including box kites, a Pelicanstyle kite made in China that is about 30 feet long, a serpent tail-style kite and a large kite that looks like the legs of a soccer player. “As it flies, the soccer player kicks his legs,” Davison told them. Students took turns showing their kites to Davison, who gave them pointers on how to improve them. According to Miller, her students were impressed by Davison’s knowledge of kite design and many of them were eager to make improvements to their kites based on what they had learned from him. Miller has instructed her students to write an essay describing their kite design, the geometry components involved and their kite-flying experience. “They will use Glenn’s information to discuss why their kite flew or didn’t fly and what they would do differently to improve the experience,” she said. Enjoy this video with scenes from 2005 & 2007. Thanks! The CKF-FCCV is an umbrella organization representing the variety of kite interests across Canada. We are kite fliers, kite makers, kite collectors, and kite educators.